'Empire' Actor Jussie Smollett Files His Plea In Alleged Attack Hoax Case Chicago police say the Empire actor faked the January assault, and now he faces the prospect of prison time. Actor Jussie Smollett arrives at the Leighton Criminal Court Building for his hearing Thursday in Chicago. The actor's plea comes just a month and a half after his original police report grabbed national attention. In the report filed in late January, Smollett told authorities that he had been jumped while walking through downtown Chicago just past midnight. According to the Empire star, who is black and openly gay and who plays a gay character on the television show, his two assailants verbally showered him with racial and anti-gay slurs — before physically assaulting him, pouring a chemical on him and leaving him with a rope wrapped around his neck. When it surfaced, the report elicited outrage from both his colleagues and national politicians. But within a month, the story appeared to unravel. Chicago police eventually arrested Smollett on suspicion that he had faked the incident "to promote his career," saying at a news conference last month that he paid his would-be attackers — brothers Olabinjo and Abimbola Osundairo — to carry it out. Superintendent Eddie Johnson said that the two men implicated Smollett while under police interrogation and that authorities had the check that Smollett wrote them in payment to prove it. "As more evidence, such as text messages, phone records, social media records, bank records, surveillance video and the receipt from the purchase of the rope was obtained by investigators, the investigation shifted from a Hate Crime to a Disorderly Conduct investigation [against Smollett]," prosecutors explained in their bond proffer. Smollett, meanwhile, vehemently defended himself against what his legal team — in a statement last month — called "an organized law enforcement spectacle that has no place in the American legal system." "There has been a lot of misinformation in this case that's been presented as fact and evidence against Mr. Smollett that is demonstrably false," his attorney Tina Glandian said after a hearing Tuesday in Chicago, as her client walked quickly past the media scrum. "We welcome cameras in the courtroom so that members of the media can see the actual evidence — and what we feel is actually going to be a lack of evidence — against Mr. Smollett. And we look forward to complete transparency and the truth coming out." The actor's colleagues on Empire wasted little time in responding to the allegations. In a statement released just a day after his arrest, the show's producers said that they "care about him deeply" and that they were placing "trust in the legal system as the process plays out." But they added: "We are also aware of the effects of this process on the cast and crew members who work on our show, and to avoid further disruption on set, we have decided to remove [Smollett's] role of 'Jamal' from the final two episodes of the season." A grand jury in Cook County, Ill., indicted Smollett on 16 felony counts of disorderly conduct last week. Each count carries a possible penalty of up to three years in prison. 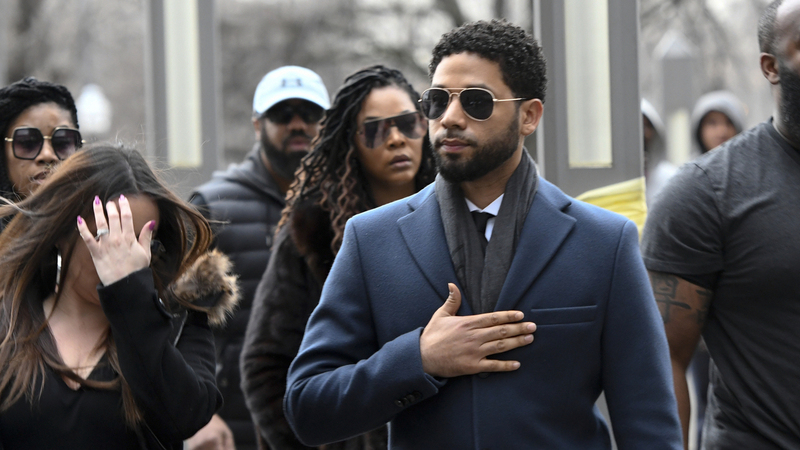 Smollett is expected to return to court in April.